State Police Departments in Australia are quite well regarded by the public. They are also rather conservative organisations not in the habit of issuing criticisms, other than perhaps on stupid drivers. 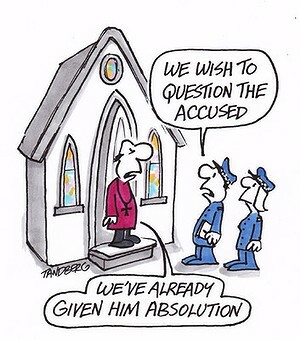 This makes the vociferous attacks by the Victoria Police on the Catholic Church all the more extraordinary. On the first day of the Victorian enquiry hearings, Deputy Commissioner, Graeme Ashton, lashed out at the Catholic Church on a number of fronts, leaving many open-mouthed in shock. Ashton accused the Catholic Church of taking elaborate measures to avoid the criminal justice system. He also blasted them for being more focused on internal church issues such as legal liability and public relations rather than the long-term interest of victims. Ashton’s evidence reflected criticisms detailed in the Victoria Police Department’s official submission to the enquiry. Largely for the benefit of readers in Australia outside Victoria, and for those following this blog in other countries, some excerpts from that submission are given here. A failure to make offenders accountable to the law. With regard to the Melbourne Response (see previous postings) the submission states, “Victoria Police has serious concerns regarding the terms of this inquiry process and its appearance as a de facto substitute for criminal justice. As noted on its website, the Melbourne Response has made a number of ex gratia payments to victims. In spite of this, it has not referred a single complaint to Victoria Police. This inquiry process is not a replacement for a criminal investigation undertaken by a law enforcement agency. The main recommendation of the Victoria Police submission involves a law change: “It is the opinion of Victoria Police that such deliberate action should be criminalized. It may be appropriate to consider an offence similar to the NSW offence of concealing a serious indictable offence’ (s 316 Crimes Act 1900 (NSW))” (see previous posting on the NSW enquiry). [Postscript: The Royal Commission is finally due to make a further announcement this coming Wednesday].